Multiple genetic and environmental risk factors can trigger autoimmune thyroid disease in humans, according to experts here at the American Thyroid Association (ATA) Spring 2010 Meeting. Gregory A. Brent, MD, professor of medicine and physiology at the David Geffen School of Medicine at the University of California at Los Angeles, presented the findings. A number of toxicants affect iodine uptake and thyroid hormone synthesis, metabolism, binding, and action, he explained. He noted that among the more common agents that affect thyroid metabolism are perchlorates (a rocket fuel additive), thiocyanates (a compound in cigarettes), and dioxins (a class of pesticides). Few studies assess how these agents affect humans, he added. The thyroid is influenced by toxicants. Researchers know very little about their effects in humans. These compounds include polychlorinated biphenyls (PCBs), pesticides, polybrominated diphenyl ethers (PBDEs), and bisphenol A (BPA). Autoimmune hypothyroidism has been shown to be a consequence of vaccination in dogs. Many Gulf War veterans and anthrax vaccine recipients have developed thyroid disorders, usually hypofunction but also Graves' disease and thyroid cancers. Raw thyroid cancer rates in servicemembers before and after receiving 1-3 anthrax vaccine doses revealed that cancer rates tripled after vaccination. See tables G1-G3 of the IOM report. The local Frederick News-Post filed a FOIA to learn the number and type of infectious incidents and injuries that had been reported over the past few years. Last November an employee was sick with tularemia for 3 weeks before being diagnosed, Most likely she inhaled the bacteria. Of the 16 reports that involved a potential exposure to viruses or bacteria, three workers were bitten or scratched by an animal, two were pricked by a needle and three were splashed by contaminated liquids. Three workers each filed a report for a Feb. 9 incident involving a mouse that had been exposed to Yersinia pestis, the bacterium that causes the plague. One worker was weighing the mouse's spleen and dropped the petri dish containing the possibly infected organ. None of the three workers was wearing any respiratory protection, so they were put on antibiotics until the spleen tested negative for Yersinia pestis. After this accident, USAMRIID decided workers would weigh tissue in snap-cap vials instead of petri dishes. Last June, a lab technician working with a primate infected with the Ebola-Zaire virus noticed a 1-centimeter tear in the right index finger of the worker's protective blue suit. The inner glove had not been punctured, and the technician's finger had no breaks in the skin, so the incident was deemed to have "negligible risk of disease." What this demonstrates all too vividly is that when working with live animals the protective, high-containment suits are inadequate to prevent infectious exposures via bites and scratches. Stuff happens, and workers are not always prepared with respiratory and eye protection for splashes or simply inhaling the bugs they study. Work-related infections are sometimes not diagnosed early enough to prevent exposure to the surrounding community. One study, reviewing incidents discussed in scientific journals from 1979 to 2004, counted 1,448 symptom-causing infections in biolabs, resulting in 36 deaths. About half the infections were in diagnostic laboratories, where patient blood or tissue samples are analyzed, and half in research laboratories. That was an indication that the heavy liquids known as “drilling mud” were filling the chambers of the blowout preventer, replacing the escaping oil. In the morning, U.S. officials expressed optimism that all was going well. “The top kill procedure is going as planned, and it is moving along as everyone had hoped,” Coast Guard Adm. Thad Allen, the leader of the government effort, told CNN Thursday morning. It was not until late afternoon that BP acknowledged that the operation was not succeeding at halting the leak, and that pumping had halted at 11 p.m. Wednesday night. One of the first acts undertaken by the Obama DOJ that actually shocked civil libertarians was when, last February, as The New York Times put it, Obama lawyers "told a federal judge that military detainees in Afghanistan have no legal right to challenge their imprisonment there, embracing a key argument of former President Bush’s legal team." "The Government believes the British state has become too authoritarian, and that over the past decade it has abused and eroded fundamental human freedoms and historic civil liberties." The UK government's new platform promises to"roll back state intrusions," "scrap the ID card scheme," "outlaw the fingerprinting of children at school without parental permission," "defen[d] trial by jury," and establish a Commission to investigate the creation of a Bill of Rights that incorporates and builds on all our obligations under the European Convention on Human Rights... and protects and extends British liberties." Thank God for the sanity of our friends across the Pond. Maybe someday we will follow in their footsteps and restore the rights that our Constitution granted? LONDON — The new coalition government is to scrap a national identity card scheme introduced by former prime minister Gordon Brown's administration, it announced Thursday. The scheme will be abolished within 100 days under legislation presented by Home Secretary Theresa May, the first bill to be introduced to parliament by Prime Minister David Cameron's government. The expected new legislation "is the first step of many that this government is taking to reduce the control of the state over decent, law-abiding people and hand power back to them," said Home Secretary May. "With swift parliamentary approval, we aim to consign identity cards and the intrusive ID card scheme to history within 100 days," she said. The (Israeli) Defense Ministry has recognized a former soldier who participated in the army's experiments on an anthrax vaccine as a disabled veteran after he developed Crohn's disease. For two years, it denied similar recognition to another veteran who has the same disease, which causes severe bowel infection (sic), and participated in the same experiments, until a court overruled that decision last month. The ministry said the cases differed, as the first soldier contracted the disease during the experiment and the second only three years later. Altogether, 716 soldiers took part in the trials from 1998-2006, and many later said they were pressured to "volunteer." Many have also since developed medical problems. Well guess what? US recipients of anthrax vaccine also have statistically significant raised rates of Crohn's disease, according to Defense Medical Surveillance System data provided to the Institute of Medicine in 2001. Is anyone surprised? Yet every US soldier being deployed still receives multiple anthrax vaccinations (the initial course is 5 doses over 18 months). The original excuse was that Saddam might use anthrax (we gave him some: strain Vollum 1B) on our troops. Saddam is gone, but the combination of inertia, and a vaccine manufacturer that knows how to grease palms, continues to disable vulnerable members of the US military. How much swine flu vaccine was truly used? What does CDC's numbers game tell us? Here are some anomalies in CDC's reported data. Note that all the data come from information provided by CDC on April 1-2, 2010 (using the same dataset) and were said to reflect information through January (MMWR) or February (per Schuchat) 2010. 1. Local reporting (May 18) has it that New Jersey used 1.14 million doses of swine flu vaccine; 65% was given to children. New Jersey has 8.7 million inhabitants. If everyone got one dose, 13.1% of the population would have been vaccinated. But children 6 months through 8 years were advised to receive two doses. So the percentage of vaccine recipients is less than 13.1%. Yet CDC estimated that 17.8% of New Jersey residents were vaccinated. Surprisingly, on April 1, CDC's Ann Schuchat claimed the state with the lowest vaccination rate was Mississippi, at 13%. Mississippi has the lowest per capita income in the US. New Jersey has the second highest. It is very unlikely that New Jersey had as low a vaccination rate as Mississippi. At least one of these numbers is wrong, and I'm betting that Mississippi's rate is exaggerated upward. 2. New Jersey has given us a real number, unlike CDC, which can only cite telephone surveys of how many people said they got vaccinated. Based on these surveys, 72 to 81 million Americans received swine flu vaccinations. Yet, as I've noted previously, every office that received swine flu vaccine from CDC (and there was no other way to get this vaccine in the US) was required to file weekly reports with CDC providing the precise number of doses administered. Although I have searched at length (on CDC's website and in the media) for the number of vaccinations reported to CDC by medical providers, I can find no mention of it. The USA has 75 million children under 18. That is 27.6 million kids vaccinated (36.8%). Those over 65 comprise 12.6% of the population of 309 million, or 38.9 million. 8.57 million (22%) were vaccinated. Those 18-65 in the US number 195 million. 28.1 million of them (14.4%) were vaccinated. 4. There is no way to know if the vaccination rates by age that CDC provided are accurate, if they are gross approximations or fabrication. It is a crying shame that federal agencies are under no compulsion to tell the truth. This is imho worse than lying--because CDC used millions of taxpayer dollars to fund phone surveys asking people if they were vaccinated, in order to develop incorrect estimates of the number vaccinated: because CDC did not want to provide the correct number to the public. I call that adding insult to injury. Sometimes Don Quixote beats the windmill. It happened for Marc Edwards, a lean, intense Virginia Tech environmental engineering professor. Drawing on what he called his own "world-class stubbornness," he mounted a six-year campaign that succeeded last week in forcing the federal Centers for Disease Control and Prevention to admit that it had misled the public about the risk of lead in the District's drinking water. The CDC, which is the nation's principal public health agency, made the confession in a "Notice to Readers" published in an official weekly bulletin Friday. It came a day after a scathing House subcommittee report said the agency knowingly used flawed and incomplete data when it assured D.C. residents in 2004 that their health hadn't been hurt by spikes in lead in the drinking water. . .
Edwards's effort cost him thousands of hours away from his young family in Blacksburg. Officials at the CDC and the EPA tried to smear his professional reputation, dismissing him as just an engineer rather than a qualified health professional. For a while, the crusade cost Edwards money as well. In 2004, he passed up a $100,000 EPA contract to consult on the issue, because he felt that he would be working for the wrong side. He put his family in debt by spending tens of thousands of dollars, mostly on fees for endless Freedom of Information Act requests to get data critical to his research. . .
Edwards said the key breakthrough came in early 2008. That's when he finally persuaded Children's National Medical Center to share data so he could do an independent study of lead levels in D.C. children's blood samples. The CDC and other agencies were refusing to provide him with such information. . .
That study blew a hole in the CDC's 2004 report. The agency had said "no children" were identified with elevated, unsafe blood levels, "even in homes with the highest water lead levels." The CDC now concedes that its scientific credibility has suffered a blow. It blames the problem largely on poor writing in the report. "Looking backward six years, it's clear that this report could have been written a little better," said Tom Sinks, deputy director of the CDC's national center for environmental health. Edwards said the CDC is still trying to hide its misdeeds. "There's a lot of lessons here for how science can go awry, how bureaucracies can use science to hide the truth," Edwards said. . . The BBC (Imogen Foulkes) asks, " Was the WHO right to declare a global swine flu pandemic? Who made the key decisions that led to countries buying millions of doses of vaccine?" In June 2009 the head of the World Health Organisation (WHO) declared swine flu a global pandemic. Governments around the world sprang into action and ordered millions of doses of vaccine. But in the event thousands - not millions died - and swine flu proved to be less dangerous than ordinary seasonal flu. So why did the WHO announce a pandemic and were they right to do so? For Assignment Imogen Foulkes visits two countries in Europe, one of which ordered 90 million doses of vaccine and used just 10% of them - the other of which ordered none. BBC asks the key questions, doesn't allow the experts to sidetrack the debate, and provides an excellent overall discussion of the issues involved and the high level of secrecy (and lack of accountability) for decisions made at WHO. There is a 25 minute long audio production in which interviews were conducted with Keiji Fukuda (current influenza chief and deputy director at WHO), a former WHO influenza chief who designed WHO's pandemic protocols, epidemiologist Wolfgang Wodarg, MP Paul Flynn, epidemiologist Tom Jefferson, and officials from Poland, Novartis Vaccines and others. For a shorter BBC story in print, go here. It is EXTREMELY WORTHWHILE. GENEVA -- An expert panel investigating the World Health Organization's response to last year's swine flu outbreak said Wednesday it wants to see confidential exchanges between the U.N. body and drug companies. "We will want to have access to certain confidential documents that may be in place here at WHO or elsewhere," Fineberg told reporters in Geneva. The BBC, 2010: Smallpox demise linked to spread of HIV infection. 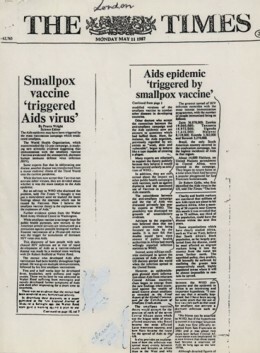 Both (directly opposed) conclusions came from studying the same phenomenon: smallpox vaccinations used widely in Africa in the mid 1970s, followed by an explosion of AIDS a few years later. Smallpox vaccinations followed a 'ring' strategy, vaccinating everyone in the areas around new cases. It was often these very same areas where HIV erupted a few years later. So many of those who developed AIDS had, in fact, received smallpox vaccine. Smallpox vaccine may improve the ability of immune cells to fight the HIV virus. Regardless, the epidemiological fact is that many cases followed vaccination within a short span of years. There have been large numbers of major adverse reactions to this year's seasonal influenza vaccine in Australia, and the vaccine has been suspended for use in children aged five and under... Assuming all convulsions were in children, about one child in every 500 vaccinated had a febrile convulsion. Across Australia, media accounts indicate that more than 400 adverse reactions  including 77 cases of febrile convulsion  have been reported by regulators. While attention remains focused on reactions in very young children, reports suggest only one-third of the reactions may have occurred in children under five . Prepandemic vaccinations have been discussed for years, quietly, by the international flu elite. They were a "win-win" approach: the elite recommending them would be viewed as heroes when the pandemic came (just as our public health officials assumed that the patina of a Salk or Sabin would rub off on them for saving us from swine flu). The other win was that big pharma would do very well by doing good. I hope that Secretary Sibelius, WHO Director Chen and others have learned that despite the good reputation of vaccines, in general, they are not made of fairy dust. You cannot simply exhort the masses to take them, while spending like a drunken sailor to buy them, and expect there will be no accountability down the road for your lack of attention to details... your unwarranted fearmongering... your inability to take the "off ramps" Secretary Sibelius promised were being built into the American program. "While some have questioned some of the actions taken by the international community, the outcomes speak for themselves. I believe we made the right decisions at the right times," said US Secretary for Health Kathleen Sebelius. As CIDRAP makes clear here and here, the 1976 swine flu vaccine program and the 2003 smallpox vaccine program were dismal failures, causing hundreds or thousands of serious reactions for diseases that were not circulating on planet Earth when the vaccines were administered, and have not been seen since then, either. The predictions of doom for 2009's swine flu were made and repeated like mantras, despite lack of support from the data. And CDC was very slow to share that data. In public policy, as in our national sport, after 3 strikes, you're out. Therefore, I think the plan to issue us pre-pandemic body armor has been sidelined, at least until the public forgets about these 3 vaccine fiascos. At least for now, the policymakers can spend our money to buy vaccines without consent, but they can't force them into us. That is, unless you attend school, work in the military, or work in many healthcare establishments. Soldiers, for example, are still receiving mandatory smallpox inoculations. Hmm. ... Against a background death toll from seasonal flu of up to 500,000 [worldwide], the new H1N1 strain was invisible [18,036 documented deaths through May 9, per WHO]. The last time [swine] H1N1 showed up was in 1976, at a US army base. Washington ordered the immunisation of 40 million Americans before it discovered that it had only one death from the flu but hundreds of cases of severe side-effects to the vaccine. A review headed by Dr Harvey Fineberg put much of the blame on the "influenza fraternity", arguing that expert panels tend towards "group think" and should be backed up by independent scientific advice. Dr Fineberg is now chairman of the WHO's external committee evaluating its response to the 2009 outbreak whose final report next May could well lead to a radical rethink of the world's reaction to new viruses. Helen Branswell reports on "a bold proposal on how to circumvent too-slow production and too-little output of influenza vaccine during a pandemic." You saw it here and here first, when I blogged about what pandemic "experts" talk about when they don't have a pandemic: so-called "pre-pandemic" vaccinations. It would be a great idea if we knew the strain that was to infect us in future, except that we don't. The experts hope that maybe they will guess right, and the pre-pandemic vaccine selected will provide some immunity when that bad old pandemic finally shows up. Or at least it might reduce the number of shots we need from two to one, doubling vaccine coverage. Dr. Klaus Stohr, former head of the World Health Organization's global influenza program, is suggesting the world consider pre-vaccinating people, giving them protection against strains that could emerge from nature to trigger future pandemics. In an opinion piece published Thursday in the journal Nature, Stohr argues pre-pandemic immunization may be one of the few solutions to a vexing problem — there is no way to make pandemic vaccine fast enough and in large enough quantities when it is needed to have an impact on the toll the outbreak takes. Stohr is now vice-president of influenza strategy for Novartis Vaccines and Diagnostics, the world's No. 2 flu vaccine producer and a company which stands to gain significantly if his proposal were to take off. Still, he insisted that he — not Novartis — is making the proposal because the pandemic response model needs to be fixed and the available options are limited. Michael Osterholm, who heads the Center for Infectious Diseases Research and Policy at the University of Minnesota, doesn't believe Stohr's proposal is the answer. For one thing, he said, most countries that had H1N1 vaccine couldn't persuade even a third of their citizens to take the shot. Poor uptake even in the midst of an outbreak throws into doubt how willing people would be to get vaccinated against viruses they might never encounter. "Even if you had a similar subtype vaccine, there's no guarantee whatsoever there'd be any protection against a similar subtype that emerges as the pandemic strain," Osterholm said. It might seem counterintuitive but it also appears to be true: Parents with more education were less likely to get their daughters vaccinated against HPV during the first year of British Columbia's free school-based program, a new study shows. The HPV study was conducted primarily by researchers at the British Columbia Centre for Disease Control and the University of British Columbia. The group surveyed parents of Grade 6 girls who had been eligible to get HPV or human papillomavirus vaccine through a free, school-based program in B.C. in the 2008-09 school year. Nearly half (47.9 per cent) of those who let their daughters get HPV shots said they did so because they had confidence in the effectiveness of the vaccine. Advice from a doctor and concern for the health of the daughter also played into yes decisions. Among the parents who said no, concern about vaccine safety was listed as the major reason for the decision (29.2 per cent). A substantial portion — 15.6 per cent — felt their daughters were too young to get the vaccine and listed that as their major reason. Both the US government and BP have refused to explain the math behind their spill calculation; and methods for a more accurate estimate of the flow rate have not been applied, according to the NY TImes. Experts suggest the actual rate may be 5 times as great as the stated rate, 5,000 barrels per day. UPDATE: How much did governments spend on Swine Flu vaccines and drugs? Makers of H1N1 vaccines reported sales of $3.3 billion in 2009, according to company reports reviewed for its title, "H1N1 'Swine Flu' Vaccine Market Review." Kalorama believes the contracting, production and distribution of this vaccine will be a model for future pandemic vaccines. UPDATE: Switzerland's Roche Group saw sales of its Tamiflu antiviral medication jump by 2 billion Swiss francs ($1.74 billion) last year. Remember, these figures are for 2009 only. Glaxo reported expectations for H1N1 vaccine sales in 2010 to be 883 million pounds (1.3 billion dollars), about equal to what they made in 2009. Glaxo is one of 5 companies that sold vaccine to the US Government, but Glaxo sold comparatively little in the US. Yet total sales worldwide for Glaxo H1N1 vaccines are expected to reach 2.6 billion dollars. Throw in the other manufacturers and you may be looking at about 10 billion dollars worldwide just to purchase swine flu vaccines. And probably a couple billion more for antiviral drugs. In fact, 2009 H1N1 vaccination began in early October—just 5 months after the emergence of 2009 H1N1 influenza. Critical support from Congress resulted in $1.44 billion for states and hospitals to support planning, preparation, and implementation efforts. According to these official numbers, issued through November 2009, the USA spent 2.254 billion dollars on vaccine antigens, attenuated live vaccine and adjuvants, plus 1.44 billion for state and hospital planning, for a total of 3.694 billion dollars spent on swine flu vaccine preparation. This may not cover all costs of administration, nor all vaccine costs. The novel adjuvants were not used. UPDATE: From Agence France Presse: "In France, for instance, the purchase of 94 million vaccines cost the state around 600 million euros [over 750 million dollars], but only less than 10 percent of the population went to get vaccinated." Clearly, worldwide spending for H1N1 swine flu vaccine, vaccine administration and antiviral drug costs will amount to much more than the 4 billion dollars recently claimed by an American delegation to a WHO swine flu meeting. How many H1N1 doses are being wasted? Many reports in the past week have claimed that 71 million doses of H1N1 vaccine are being wasted in the US. Earlier reports, based on telephone surveys, said 70-80 million doses had been used already. The Wall Street Journal, quoting CDC offical Anne Schuchat, M.D., earlier claimed (along with other media outlets) that 251 million doses had been ordered for the US. The date was October 19, 2009. On May 4, 2010, NPR said the US ordered 229 million doses of vaccine. This isn't the first time Schuchat's figures didn't add up. If you subtract 80 million (a generous figure for doses administered) from 251 million ordered, you have 171 million doses left, not 71. Now, Reuters reports that "Sebelius said last month that 162 million doses were produced and distributed, but only 90 million actually got into people's arms or noses." Why do these numbers keep changing? I have a sneaking suspicion the other 70-90 million doses are still in government storage, and were never distributed... allowing a clever wordsmith like Sibelius to "disappear" them. The CDC findings were released on the same day that Washington Post staff writer Rob Stein noted that there were 138 million unused doses of the vaccine remaining. Of those, approximately 60 million will be donated to poor countries or stored for future use, but more than 71 million vaccines have already been placed in vials or syringes and must be used or disposed of by their expiration dates. CDC has let the cat out of the bag. Presumably because increasing numbers of Americans are vaccinated for flu each year, while the number and rate of flu deaths never drops... CDC will recommend flu shots for ALL Americans stating this year. That must be because the flu vaccination program is so successful... for vaccine manufacturers and the CDC careerists they are in bed with. (Hi Julie Gerberding, how's that job at Merck Vaccines going?) And these days, a few billion taxpayer dollars for flu is just chicken feed, anyway. Swedish swine flu vaccine cost $121 million. Sweden has 9 million people. The US vaccine was more expensive than European vaccine, since we omitted novel adjuvants and instead used more antigen. It will be very interesting to see if DHHS produces the facts about what the H1N1 flu vaccine cost, and how many doses were purchased, in response to Senator Grassley's inquiry. UPDATE May 24: Ohio has 2.5 million unwanted swine flu doses, of which 1.5 million are already expired. The NHS is being forced to cut services because of the huge costs of the swine flu scare that proved unfounded. A survey has found that as many as one in six health trusts may have to slash services - or already have done so - to recoup costs. The cuts required to pay for swine flu preparations are on top of the cuts needed after the election as the NHS adjusts to a post-credit crunch world. And, for the first time, it has emerged that the average cost of the swine flu scare to primary care trusts was £340,000 - enough to pay the salaries of 17 nurses. Dr Richard Vautrey, deputy chairman of the British Medical Association's GP Committee, said individual trusts should not have had to foot the bill. 'I think a pandemic should be seen as an exceptional circumstance and a PCT should be fully supported by central government,' he said. The members, who come from across the political divide, said one of its aims would be to evaluate the EU's dependence on the World Health Organisation. Speaking at a news conference in parliament on Wednesday, Belgian Greens MEP Isabelle Durant said the management of the outbreak had "seriously undermined the credibility of, and confidence in our institutions". She is one of the MEPs who have sent a letter to parliament's president Jerzy Buzek asking him to set up a committee to investigate last year's outbreak. The letter says, "Member states have reportedly spent billions on anti-H1N1 vaccines despite the fact that shortly after it emerged, it was found to cause only mild illness. "The number of deaths due to H1N1 is very small compared to those estimated for seasonal influenza." It adds, "It is of paramount importance to ensure future EU pandemic responses carefully assess the nature of the pandemic and the risks of vaccination strategies." Another signatory, Polish EPP member Boguslaw Sonik said, "We want to know why the commission and public health authorities did not issue a statement modifying their initial strategy. "Also, why did the EU institutions not provide the public and media with good, objective up-to-date communication?" According to data from the European Centre for Disease Prevention and Control, H1N1 caused 1528 deaths. In comparison, commission statistics show that seasonal influenza causes some 40,000 deaths in an average year and up to 220,000 in a severe year. WASHINGTON – Senator Chuck Grassley has asked the Secretary of Health and Human Services for additional information about the government’s supply of the H1N1 vaccine, based on information provided by the Secretary in an earlier response to Grassley and policies of the Centers for Disease Control and Prevention regarding distribution. Senator Grassley’s new questions can be accessed here. His earlier letter on swine flu vaccine to Secretary Sibelius is found here. Secretary Sibelius' reply to his earlier questions is here. Meantime, the BBC reported from Northern Ireland that one prominent physician (Dr. Brian Dunn, chair of the GP Committee of the British Medical Association) said, "Swine flu bill 'hard to justify.'" The death rate from those suffering from the virus across the UK was low, at 0.026%. In addition, hundreds of thousands of people are thought to have been infected but not displayed any symptoms. The cost to the Department of Health is £44m. "I would not like to be accounting for that," Dr Dunn said. "At a time when money is scarce and is likely to get scarcer; at a time when waiting lists are going up; at a time when we are talking about cuts in front-line services, I think it is very hard to justify that." An Army lab at Fort Detrick said Tuesday it did not follow proper procedures last November when a researcher infected herself with the tularemia bacteria. The researcher at the U.S. Army Medical Research Institute of Infectious Diseases was exposed to the bacteria between Nov. 13 and 17, and USAMRIID's health team did not realize she may have contracted the disease until Dec.
Each time a hurricane approaches the island, scientists will have to stop their experiments and exterminate many of the viruses and bacteria they are studying, said Dr. James LeDuc, the lab's deputy director. "Many"? What about the unexterminated ones? We Americans are not very good at creating, carrying out and enforcing fail-safe procedures. We prefer to tempt fate, as the Deepwater Horizon disaster spells out clearly. It was cheaper for BP to face a potential 75 million cost in the event of disaster than to do things right. Congress acquiesced in capping their liability years ago. But now officials say they will pass a new law to up the cap. UPDATE May 5: The proposals unveiled by three senators yesterday would raise the legal cap on damages that oil firms must pay after a spill from $75m to $10bn. They would also do away with a $1bn per incident cap on an industry fund. The existing limits on liability are 20 years old, dating from the Exxon Valdez spill off Alaska. UPDATE May 6: CNN Money looks at the liability issues, costs and BP stock value resulting from the Deepwater Horizon disaster. While millions of gallons of oils are spewing from under the earth's mantle in the Gulf of Mexico, and no one has a sure-fire idea of how to stop the river of oil, we have the perfect backdrop for a discussion of Boston's Highest-Containment (BL-4) biodefense lab. The lab has been built but is still empty, waiting for its bugs. As is usual these days, inadequate attention to "What if?" considerations by the authorities led to citizen lawsuits, which have successfully kept the lab closed. During World War II, US authorities used excellent foresight, and placed labs that researched deadly pathogens offshore: for example, on Plum Island, NY and Horn Island, Mississippi. We now live in the Era of Hubris. As a society, we blithely assume things will be safe. We take cursory precautions. Deadly pathogens sometimes leave their labs by mistake, but so far no one has died (that we know of), though some people have gotten very sick. The national animal pathogens lab is due to be sited in Manhattan, Kansas-- smack in the middle of cattle country. Why inconvenience the staff by having them take a ferry to work on an offshore island? In Boston, they can take the "T". We leave it to the markets to regulate themselves, based on theories that fail to take into account human nature and past bank failures (and don't acknowledge that perfect markets are only found in economics textbooks). And when the banks that are too big to fail do fail, we print money for them, keeping our fingers crossed about the long-term consequences. Dr. Lynn Klotz and Edward Sylvester discuss the Boston University lab in the Huffington Post. They are the authors of Breeding Bio Insecurity: How U.S. Biodefense Is Exporting Fear, Globalizing Risk, and Making Us All Less Secure, University of Chicago Press, Oct. 15, 2009. This piece does a great job discussing the risks and benefits of the biolab.